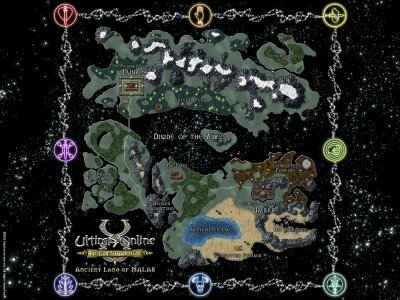 Ultima Online continued to expand itself well into its 5th year of existance. Its latest expansion (announced in late 2002 and released in Feb of 2003) was called Age of Shadows. Situated in a new land called Malas that was surrounded by a huge void, AoS offered The Syndicate new paths to walk down as a guild. The first thing offered was new land for housing. Being a very old guild The Syndicate already had 2 castles, 2 large towers, a dozen large houses and a dozen or more small ones that were all guild property. Its members had 200+ houses between them ranging from the smallest house to the largest castle. So new housing space wasnt an issue for us. What was an issue was the new customization tool. Using that tool you could replace your current house with one of your own design. You could have teleport pads, walls of many styles and a large number of other features. This offered us many opportunities to shape how Arx Draconis looked. In addition many new monsters were added but also new craftable items. The Syndicate has always had a very strong craftsman part of the guild and our vendor shops do millions of gold in business each week. AoS offers new craftable magical items that expand our offerings and leverage our numbers of merchants to our advantange over others. And finally, AoS offers new forms of combat. These come in the forms of special moves, new classes (Paladin and Necromancer) and new rules for Felucca (everything becomes lootable again and no stats loss for reds). Members are able to add in skills like the Paladin Chivalry skill and the Necromancers skills and get even more powers that expand the ways we fight. Spells are reworked and special moves can be learned to do more specialized damage. UO definitely got a complete makeover with AoS and its one that extended its lifespan even further than its already impressive 5 year run. The Syndicate continues to reign supreme in UO as the largest, most successful and oldest guild in the game.